Different event, same result. Like in singles, the Swedish women’s national team won gold, silver and one of two bronze medals in doubles in the Women’s European Championships Monday at bowling center Bowling Stones in Brussels, Belgium. The three Swedish duos were joined by a French team. Once again, the title match was an all-Swedish affair. 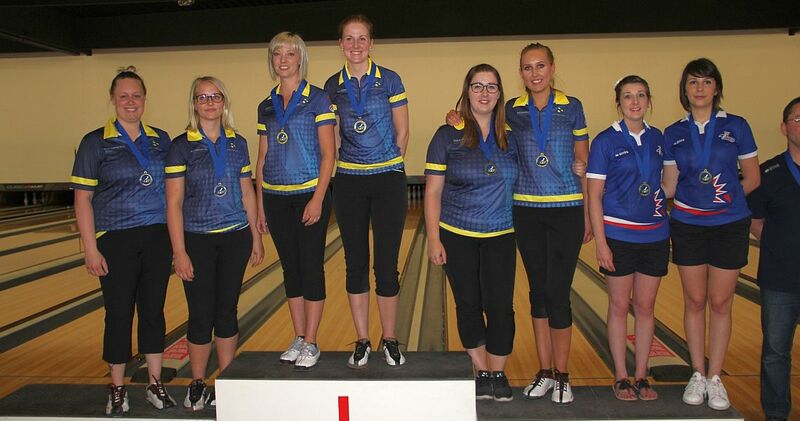 Isabelle Hultin & Nina Flack (above right, l-r), seeded third, edged their team mates Victoria Johansson & Cajsa Wegner (left, l-r) by three pins, 390-387, to claim the gold medal. Johansson and singles gold medalist Cajsa Wegner took silver. Featured photo from left: Victoria Johansson & Cajsa Wegner, Nina Flack & Isabelle Hultin, Ida Andersson & Jenny Wegner and Amandine Jacques & Solène Goron. 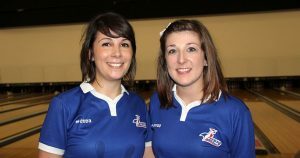 In the semi-final round, the eventual champions survived a low-scoring encounter against Amandine Jacques & Solène Goron (right, r-l) of France, defeating the no. 2 seed, 368-339. 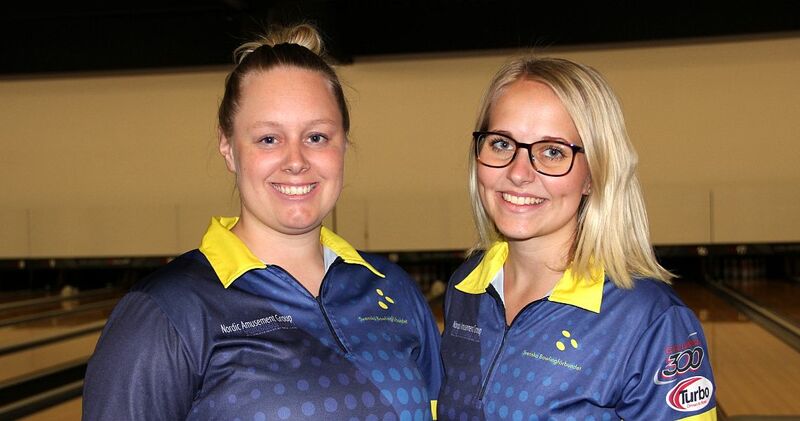 In the other semi-final match, Cajsa Wegner met her sister Jenny Wegner & Ida Andersson (left, r-l), who out-bowled the other 63 doubles in the six-game preliminaries with 2664 and an average of 222.00, leading their nearest competitors by more than 100 pins. Johansson & the younger Wegner earned their shot at the title with a 458-386 win. Jacques & Goron as well as Jenny Wegner & Andersson received bronze. With 12 out of 24 games in the books, Ida Andersson leads the 132-player field in all-events with 2683 and an average of 223.58. Victoria Johansson is 35 pins back in second place with 2648 (220.67). Mai Ginge Jensen of Denmark, a former World Champion in all-events, is third at 2629 (219.08). All six Swedes are among the top 10. Action shifts to the trios competition on Tuesday and Wednesday. 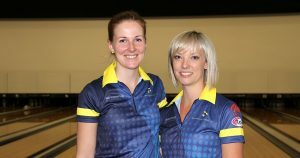 The 2018 Women’s European Championships will be held from June 6-17 at bowling center Bowling Stones, a 36-laner in Brussels, Belgium. The nine-day competition started on Friday, June 8, and culminates with the masters finals on Saturday, June 16. 132 athletes from 26 countries – Austria, Bulgaria, Cyprus, Czech Republic, Denmark, England, Estonia, Finland, France, Germany, Hungary, Iceland, Israel, Italy, Malta, Netherlands, Norway, Romania, Russia, Slovenia, Spain, Sweden, Switzerland, Turkey, Ukraine and the host country Belgium – – participate in the event. 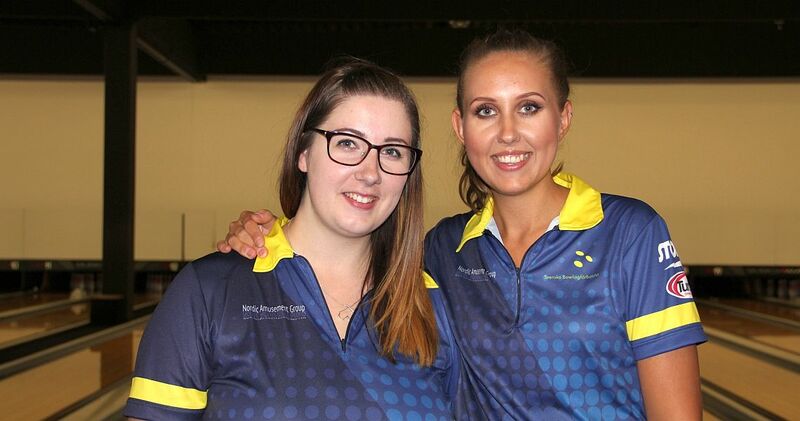 Each team consists of maximum six women, who compete for gold, silver and bronze medals in singles, doubles, trios, five-player teams, all-events and masters. Singles, doubles, trios and team events feature six games preliminaries with the top 4 advancing to the playoffs in one-game format, seeded 1 to 4 according to their position in qualifying. No. 1 bowls No. 4 and No. 2 takes on No. 3. The winners bowl for gold and silver and the losers share the bronze medals. The top three players with the highest 24-game total (combined results of the singles, doubles and team preliminaries) receive the medals in all-events. The top 24 in all-events advance to single-elimination masters match play in best-of-three games format. The top 8 receive one bye. In each round, the highest seeded player bowls the lowest seeded player, the second-highest seeded player bowls the second-lowest seeded player, and so on. Winners advance and losers will be eliminated. The remaining two players bowl for gold and silver and the losers of the semifinals share the bronze medals. Photos courtesy of Gisela Göbel (DBU). Semi-final Match 1: No. 4 Sweden (Johansson 212/C. Wegner 246) def. Semi-final Match 2: No. 3 Sweden (Hultin 180/Flack 188) def. Championship: Sweden (Hultin 176/Flack 214) def. Sweden (Johansson 221/C. Wegner 166), 390-387.